"I'm Gonna Make A Change, For Once In My Life," these are the opening lyrics to one of Michael Jackson's most critically acclaimed songs, "Man in the Mirror" released in 1988, but they are also the words that filled Royce Hall at UCLA last week during the closing performance at "A Global Call to Conscious Evolution: Our Moment of Choice." The audience of over 1,500 people stood up and clapped as Siedah Garrett, co-writer of "Man In the Mirror," sang her heart out. This keynote song was the perfect conclusion to the rare gathering of some of the greatest global thought leaders of our time. The evening opened with an evocation by Agape Spiritual Center's Reverend Michael Beckwith, accompanied by his wife Rickie Byars Beckwith and the Agape Choir. Together, with music, prayer and song, they set the stage for an evening that was sure to be inspirational. 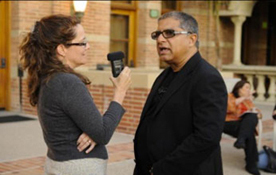 Deepak Chopra then stepped forward to welcome the audience and initiate the "Call to Conscious Evolution." I looked down at the program and it said that he was going to share about the importance of being an evolutionary leader. Immediately I thought to myself, "What does that even mean?" From what I gathered, evolutionary leadership is all about working with others to facilitate the next big evolutionary leap of consciousness. Intellectually this made some sense, but it was Jean Houston who hit the definition out of the park with an audience participation exercise. In less than 5 minutes, she told the story of evolution and instructed the audience to literally "jump" at every point in her story that signified a change in our evolution. She exclaimed how we "jumped" from sea to land creatures, we "jumped" from hunters to gathers, and now we are at a "JUMP" point in human history and the evolution of the future. A Call to Conscious Evolution August 31, 2010 After Houston's fun and effective exercise, Bruce Lipton, Gregg Braden, Barbara Marx Hubbard and Marianne Williamson shared why this action is needed and why now. Their stories and speeches led to asking the audience, "What is the single most important contribution you feel you are currently making or can make toward the evolution of consciousness?" At this point in the program, the audience broke up into pairs and shared what they felt to be their contribution to the world and what tools they needed to step into their greatness. My answer was definitely, patience. Patience with myself, my work and with others. Whether it's the tools included learning technology or mastering a language, you could see how excited people were getting at the tangibility of the action they were going to take into their lives. Groups of teachers and speakers then came on stage to share inspirational quotes about consciousness and the future. 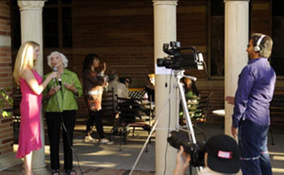 Each leader was introduced by one of the most recognized female voices of America, Randy Thomas (Oscars, Tony Awards, CBS "Entertainment Tonight"). 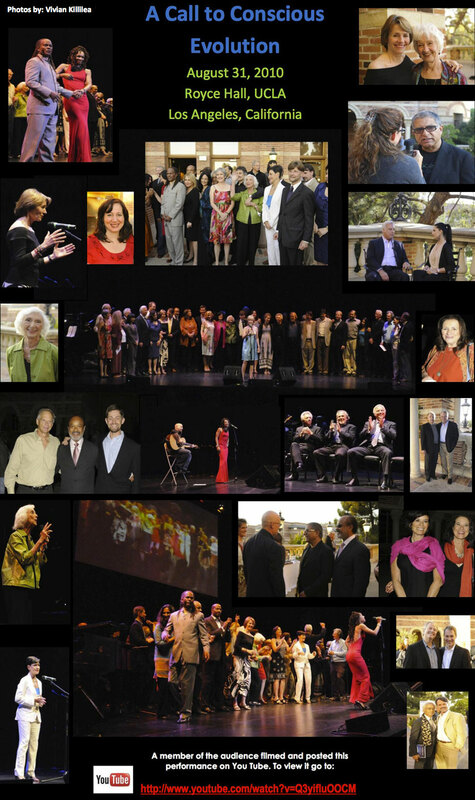 Wendy Craig Purcell, Barbara Marx Hubbard, Howard Martin, Debbie Ford, Jean Houston, Rod McGrew, Nina Meyerhof, Gregg Braden, Bruce Lipton, Gerard Senehi, Scott Carlin, Arielle Ford, Judy Martin, Carter Phipps, Emily Squires, Katherine Woodward Thomas, Brian Hilliard, Steve McIntosh, Jack Canfield, Kathy Gardarian, Tom Gegax, Van Jones, Lynne Twist, Fred Matser, Lynne McTaggart, Michael Backwith, Joan Borysenko, Dale Colton, Mark Gerzon, Deborah Moldow and Yuka Saionji all stood side by side on the stage sharing the same message of urgency and collective consciousness. What made this event different from others is not only the gathering of these great names and teachers, but that, in fact, they were all coming with the same message and that you could physically see it. It wasn't as if you were reading various opinion pieces, or books and thinking to yourself, "Yeah, that sounds familiar." It was clear, leaders and teachers from all over the world were together on stage with the same message, we need a paradigm shift in our behavior and most of all in our consciousness. Lynne Twist shared how we have been at this here before. She compared the similarities between where we are in history and the Renaissance and how we, if we choose, could have a similar impact on human history. She explained how many historians and thought leaders are looking to the Renaissance as a pivotal and reference point in our conscious evolution. The Renaissance was a time of art, creativity, invention and exploration. During this time, people abandoned the restraints of the Middle Ages and developed modern interests, enthusiasm and ideals. There was an awakening of mind and a thirst for knowledge which resulted in numerous studies of natural events, the exploration of new styles of art and literature and ultimately, in a broadening outlook to a degree never before known. And, they did in conjunction with the invention of the printing press -- now we have social networks! Twist shared that we are in a similar time we have the choice to change and truly make a difference. The Call to Conscious Evolution says that "the changes required of us are really broad and far-reaching but if we act quickly we can birth a new story...a really new age." Fellow Evolutionary Leader Deborah Moldow states that "The times we live in are calling us all to a new level of love and service. What a joy to answer this call together!" So, "how" do we answer the call and how do we change the ways of the Man in the Mirror? It's up to you. I found the answer in Siedah Garrett's newly written and world debuting song, "The Answer is Love." Gregg Braden - The most Important Moment in History is right NOW!